This is some art I made when I was 8 years old. You have to click on the thumbnails to see the art at Flickr. I made this art when I was 7 years old. Now this animation is a some clips from episodes of A Life of Animals. Maybe I will put whole episodes up. Well, the first clip is a cowboy snake trying to get rid of a giant rock monster but his lasso broke and the rock monster fell on him in pieces. The second animation is where some pirate skeletons on the wrecked ship try to get on a big boat but two of the ones on the big boat are getting away. They’re snakes. And the third animation is where a snake finds something really weird up in the sky. Watch these and maybe you’ll see what happens next if I put up the episodes. 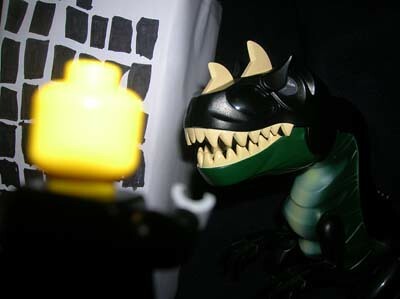 Stills for my Dino Attack movie are in the photoset linked below. There are 137. Hooray! The first video’s here. Dino Attack! Wow. I made this stop animation myself. I like Legos very much and this is a Lego animation. You can create lots of things with Legos. Even your own kind of monster. Even a giant fearless scorpion! I am soon going to get a Lego set with a scorpion with my allowance. The Lego set has people fighting against a giant scorpion. Now, let’s get to talking about the video. Well, it’s the first video and the second video is coming soon. It will be a lot longer and have more frames. I don’t use enough frames yet so my animations are jerky but soon I’ll use enough frames. This stop animation is where some people try to stop the dinosaurs. I did it with Dino Attack that I got for Christmas. I have a lot of older videos I’ll be posting too. Hi everybody! I’m glad you can come to my website. My name is H.o.p. and I am nine years old. I still don’t know if aliens exist. I thought they could exist but I don’t know yet. Now, let’s talk about my past. I used to draw a lot of the time and I am still drawing and learning to do animations. I also would like to do movies. I’m good at making up characters but I don’t know what should happen. I have plans to do a lot of animations like Robin Hood and The World of the Aliens and Lord of the Flies (only not ugly). I would like to do an animation of Red Wall but my mother says the characters belong to someone else, but I like it a lot. I do a lot of storyboards for my movies and I’m trying to choose which one can be perfect. Right now I’m interested in arachnids like scorpions. Only the scorpion, because bugs freak me out. I like to watch the animations at Animation ID. I’m watching one of the animations of a man named Gene Kelly dancing with Jerry the mouse from Tom and Jerry. How can he dance like that, with a cartoon character? My mom says that they drew Jerry in. I think it’s amazing! I will be putting up some old art work and animations and then I will soon be making some new ones and putting them up. P.S. I hope you’ll want to comment! The first time you comment you’ll have to wait to see it because mom has it set so she approves first time commentors.